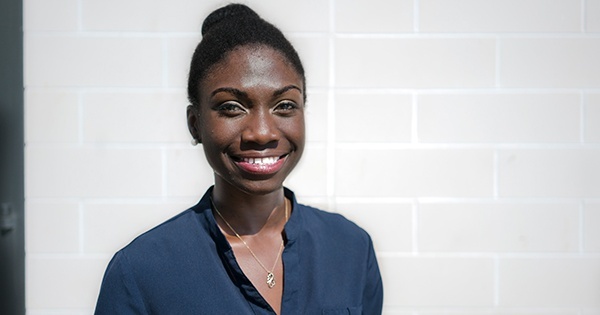 Recent University of Delaware alumna, Amira Idris, received a $20,000 grant from VentureWell’s Entrepreneur Team (E-Team) Program to aid in funding her startup, TheraV. “The reason I knew about VentureWell and the reason I was able to apply was because of Horn Entrepreneurship,” said Idris. Idris graduated from UD with a bachelor’s degree in bioengineering and biomedical engineering in 2015, and received her master’s degree in entrepreneurship and design in 2016. Since then, she has continued to grow her startup, TheraV, which offers drug-free wearable devices that employ vibration technology to manage post-amputation nerve pain. Previous to applying to the Stage 2 E-Team program, Idris took part in VentureWell’s Aspire program. “I’ve applied the takeaways from the Aspire program I attendend last April, so I am excited to see how that’ll affect me going into the E-Team and how that will help me further grow my company,” said Idris. VentureWell aids in funding and training student inventors and entrepreneurs who want to address important problems in the world through technology-based ventures. Their E-Team Program, which brings together a multidisciplinary group of students and faculty working together to bring an invention to market, is broken up into three stages. As part of the second stage, which is focused on development and validation of a business model, Idris and 19 other teams will each receive $20,000 in funding. Idris is currently working with a firm in Philadelphia to aid in the manufacturing process. She has also raised over $11,000 to give 50 of her ELIX devices to veterans with amuptations. Along with having received funding to further her startup, Idris will attend the stage two workshop from January 25-27 in Cambridge, Mass.